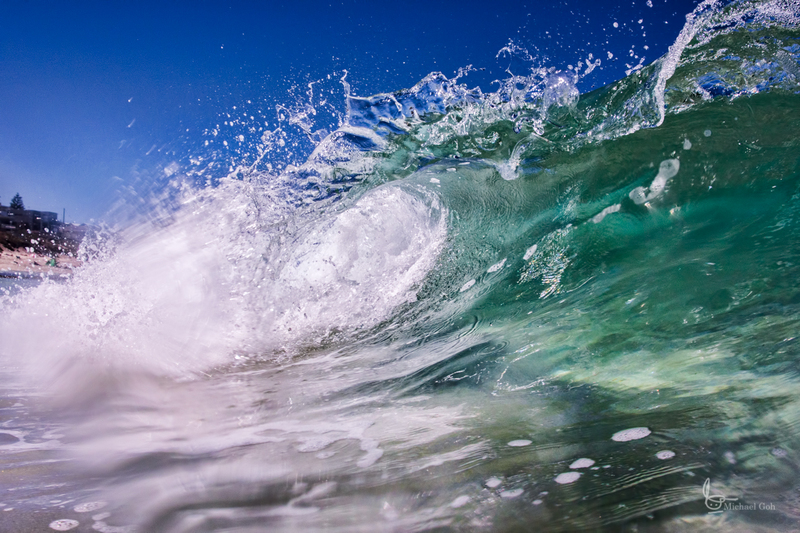 Wave and underwater photography is something that has appealed to me for awhile, but I haven’t had the time or opportunity for awhile. This post is going to be a little bit of a gear review, what I’ve started doing and lessons learnt so far. Cost – I’m not made of money. I’m also have an expectation that these forms of cameras will tend to wear out faster so the cost/benefit proposition has to be satisfactory. RAW – I want to be able to use the benefits of RAW for post processsing. 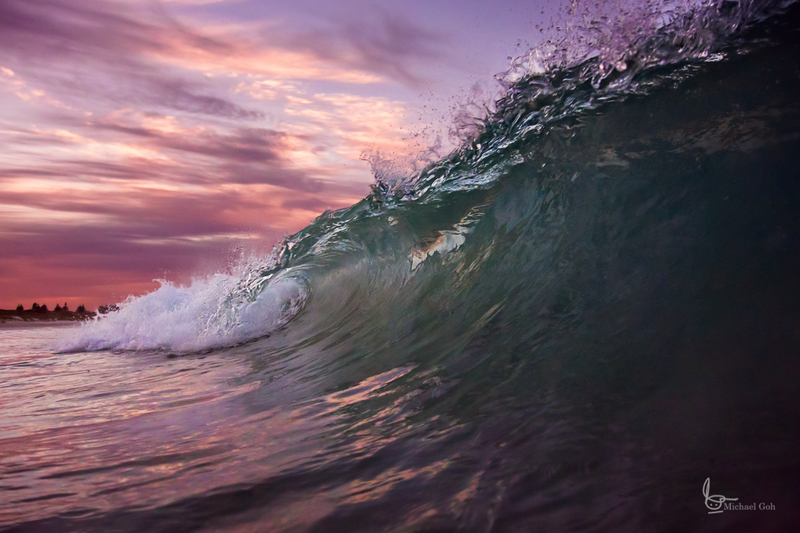 Frames per second – waves move quickly, so to get the decisive shot wanted a fast framerate. The camera can shoot 15fps and even up to 60fps. Apparently the buffer for 30 or 60fps is only 20 shots though, so I’ve been shooting 15fps to cover the duration of the wave. Underwater/durable – I didn’t want to resort to using an underwater bag for this. Being knocked over by waves would result in more strain on the bag and higher risk of failure. Other considerations include the ability to use strobes later on. The Nikon AW1 has an external strobe that can be added (at quite a lot of cost). Having said that though – I’ve got some experimental “cheap” ideas that I want to try at a later date. The camera also has a tripod mount – I’ve got all sorts of ideas of attaching it to a tripod underwater ;). The camera has 2 waterproof lenses available to it. I’m using the stock 11-27.5mm lens. The camera has a 2.7 times crop factor – so at 11mm it’s 29.7mm equivalent on a 35mm. The sensor size is a Nikon CX mount – being 13.2 x 8.8mm. Once the buttons became non-responsive. This was after some heavy shooting (>1000 shots). After I dried out the camera and took out and fully charged the battery again, it seemed to work fine again. Occassionally I keep pressing other buttons when I’m diving for a shot – but that’s just me being clumsy. No manual focus – would have been nice, but I guess they need to minimise the moving parts for waterproofing. Flash sync speed is 1/60 – thought it would be much faster than this, so when using the flash would want it to be fairly dark underwater since I’m likely to be moving around a bit. Lens fogging – happened to me once so far when the waters been pretty cold. Meaning I had to stop shooting. You can buy an underwater lens filter that will help deal with this. Minimum focusing distance on the 11-27.5mm lens is around 30cm. This means macro shots will be difficult. Maintenance is a pain. Having to regularly check the seals (normal for an underwater camera) and also removing the lens and lubricating the O ring to help with the waterproofing. So far – I think this has been a fantastic camera for the purpose. 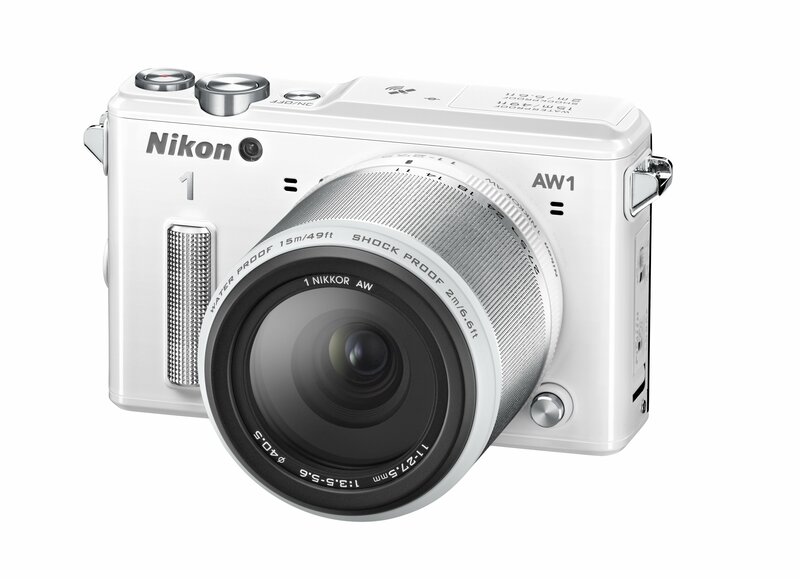 Would be nicer having a DSLR like the 7dmkii with housing and a good wide angle lens – but that is … expensive. I’d like the ability to go wider. Plus the size of the lens to improve the capability to do images that are part over and part under water (a larger housing would assist). Well apart from some underwater photography … which I’ll get back to later. I’m finding that shooting in the morning is the best for where I am. The water is “calmer” (as in not a constant pounding of rough waves) allowing for crisper water. If shooting in the mid/late morning – then the sun will cut through the water. In this image – you can see there is some blurring to the left. This is due to water droplets on the lens. hayzie47 on instagram suggested I use a freshly cut potato and rub it on the housing (thanks for that). After doing some research – I’ve settled on licking the lens intermittently. Early dawn – I’m liking on how the early morning sun comes across the water. In most of these cases, I’m only about thigh deep in water – and sometimes being a bit more adventurous and going deeper. I’m not a very strong swimmer yet, so I’m always conscious of safety. Especially in the dawn/dusk scenarios when the water is darker. When the light is dim though – I’ve been shooting at ISO 800 and due to the fast shutter 1/600-1/1000, the aperture is often wide open. Since the sensor is smaller though, the depth of field is reasonably expanded. I’ve actually used topaz denoise to assist with the noise control. 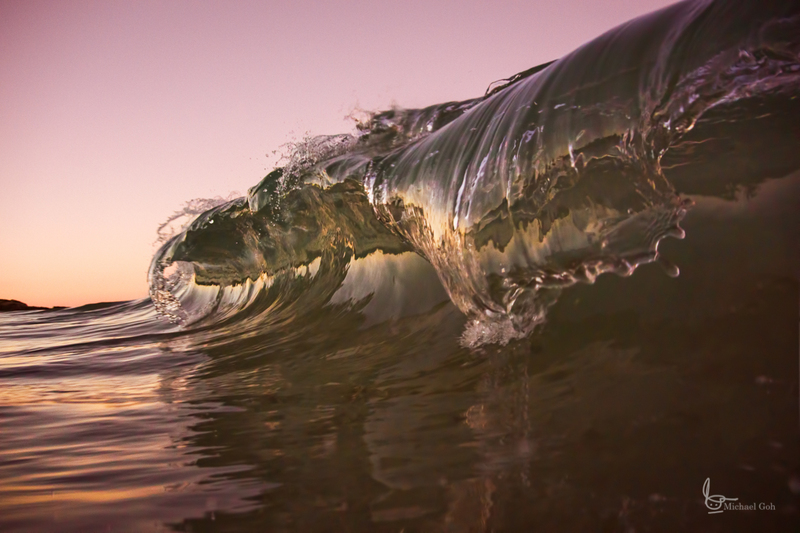 I think the majority of the wave photos I’ve seen are with really good light and can see through the water. I’ll do more of that in due course, but just like landscape photography looking for the sky colour and points of interest. At the moment – I’m staying far away from underwater obstacles like rocks/reefs – while it can provide some additional interest, the waves can push me over and I’d rather not smashing myself or the camera against something hard. This form of photography does have it’s risks – you also have to be quite comfortable with the water risks of being dumped, submerged, breathing, swimming and so on. I’m starting to be able to see the right waves coming up. I’m working on getting my framing better – it’s not easy to keep it level (usually have some adjustment) and also the majority of my wave photos so far are pointing too far into the wave. But I think I’m improving.